Disclosure: ChiIL Mama is elated to be partnering up again with Mrs. Green's Market, one of our eco-friendly favs. We have been compensated for sharing this promotion with our readers and thank Mrs. Greens for providing the coupons for our readers and gift card for our winner. 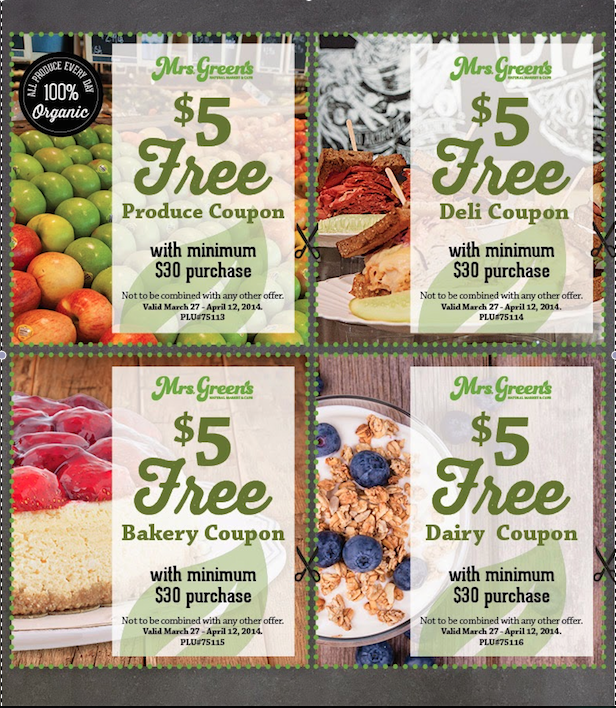 Spring has sprung and there's no better way to celebrate the green of spring in Chicago than by saving a bit of green with these ChiIL coupons and a shot at winning a $25 Mrs. Green's Natural Market gift card. Click here for some of our past Mrs. Green's coverage. WIN A $25 Mrs. Green's Gift Card. CLICK HERE TO ENTER THROUGH MIDNIGHT 4/4! Mrs. Green's Natural Market is a neighborhood store, passionately committed to clean, natural foods. We source the best local products whenever available — from your favorite groceries to produce and baked goods, we support local. Dedicated to health and sustainability. Devoted to customers who care deeply about the foods they eat. Our goal is to educate and inspire our customers to eat well and live a good, healthy lifestyle. ChiIL Mama was invited to Big Fork Thursday for a bountiful bacon sausage blogger brunch. Check back soon for our full feature! You can purchase Big Fork's fabulous, local, sausages at Mrs. Green's Market! In fact, the last time we were at Mrs. Greens they were doing a sausage demo so successful everyone was raving about them and stocking up on their 4 retail flavors. We were already in the check out line, but the buzz was so big we finished our purchases, circled around, and went BACK in to sample Big Fork's mighty fine meats. We're so happy we did. They are amazing! Mrs. Green's has great goodies for omnivores, vegetarians and vegans too. Come on by and check them out! It'll please your palate. 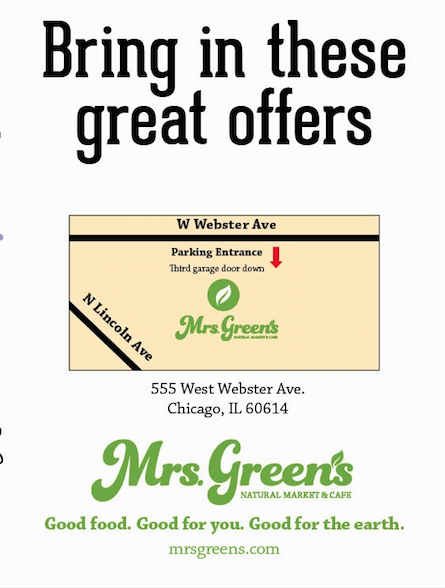 Mrs. Green’s opened in Lincoln Park last November, and they are currently working to expand their presence in the area by adding additional stores. Mrs. Green’s Natural Market (www.mrsgreens.com) is a subsidiary of Natural Markets Food Group (www.nmfg.com), a privately-owned business that consists of retail food stores and food service restaurants. The company operates over 30 locations in the U.S. and Canada, and is based in Irvington, N.Y.
Would love to go to the concert!